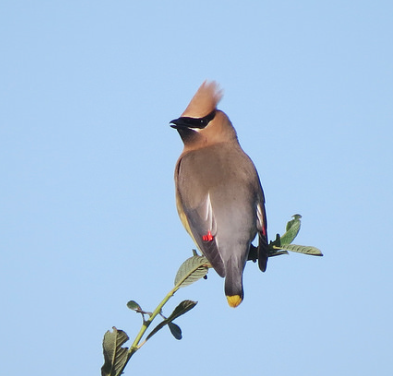 Cedar Waxwings are popular songbirds with nomadic habits. Often found in large, active flocks, these sleek, fastidious songbirds are found throughout North America. Their range varies depending on the season and available food supplies. 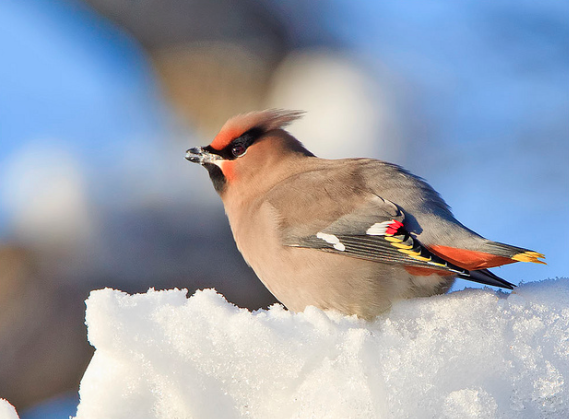 Red Feather Tips: The tips of the secondary feathers on adult Cedar Waxwings have a bright red, waxy coating that’s prominent on their gray wings. Tail Tip: The tip of the tail has a wide, bright yellow band. While this tip can wear thin in worn plumage, it is always visible. Both males and females look similar as adults, female birds may have a shorter crest and are slightly smaller. Mask: The black “bandit” mask is a key facial feature. The mask covers the dark eyes, forehead and lores in an elongated triangular shape and is ringed with a thin, uneven white border. Crest: These songbirds have a distinct crest that can be held erect or flattened against the head. The crest is the same tan color as the head. Bill: It’s thick and relatively short with a slightly curved culmen. There’s a small hook at the tip to help the bird rip into fruit which is a major component of its diet. Chin: It’s black and lacks a defined border. The edge of the chin color is blurred into the tan of the throat and breast. The amount of black can vary. Upperparts: The upperparts, including the nape, back, wings and tail, are buff-tan to gray in color with more tan closer to the head and more gray on the tail. Adult birds have no spots, mottling or streaks. Undertail Coverts: They’re white and contrast with the yellow, lower abdomen. Lower Abdomen: The abdomen and flanks are distinctly yellow, though the degree of yellow can vary and is often slightly brighter on males. Legs and Feet: They’re dark gray or black.